Varanasi… one of the most ancient inhabited cities of the world is also the oldest living city of the world. Varanasi is considered to be India's religious and spiritual hub and derives its name from the tributaries of the Ganges, Varuna and Asi that it is located on. Its original name Kashi comes from Kasha meaning the place of sacred light. The other name Benares might have been either a corruption of Varanasi by the British or from the Pali version of the word Varanasi to Baranasi to Benares. Famous author Mark Twain after visiting the city in the 19th century wrote, "Benares is older than history, older than tradition, older even than legend and looks twice as old as all of them put together." 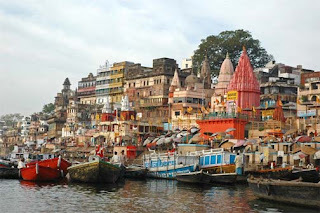 Varanasi is one of the most famous Hindu pilgrimage centers of India. Legend says that it was the dwelling place of Lord Shiva and therefore the devotees believe that a dip in the Ganges at Varanasi washes all their sins and helps them attain salvation. People from all over India come here at least once in a lifetime so that they can purify themselves. The age old people come here in the last days of their lives to die on the Ghats of Varanasi. They believe that such death would relieve them of the vicious circle of rebirth and they would attain the eternal salvation or Moksha. Varanasi is an amazing spiritual power for all ages. The old come here to die while the infants are brought here by their parents to take the first holy dip in the Ganges and worship the reigning deity, Lord Shiva. The newlywed come for the blessings of the Gods and the widows come here to lead a life devoted to the same God. Varanasi finds a mention in the epics of Mahabharata and the ancient Hindu scriptures. Although the history of the city is lost in its antiquity, it has been glorified and described in the Skanda Purana as Kashi, written nearly 5000 years ago. Kashi since then has been a centre of education and knowledge. While the city is important for the Hindus it also gained importance when Buddha preached his first sermon in Saranath, just 10 kms away from Varanasi. By the time the Chinese scholars such as Fa Xian and Xian Zhuang had visited Varanasi and written about its advanced and developed culture, the city had already grown into prominence all over India and into its neighbouring countries as the city of Temples, as the city of education and the as the city of spiritual bliss. It was renowned as the flourishing centre of religion, education and commerce by the 3rd century A.D. The prosperity of this city of temples became an inevitable bone of contention for the local rulers and also attracted the Muslim rulers of the north. From the 11th century onwards it was looted and stripped many a times till the reign of the Mughal emperor Aurangzeb. Hence although it an ancient city it hardly has any ancient temples and most of the present ones standing were rebuilt by various Hindu rulers in the 18th century. After accession by the British during the Raj and later after the Independence, Varanasi still retained its identity and remained a prominent city. With time the paths of salvation might have changed and definitions of purity may have been redefined.But even today the city holds its unique charm with narrow by lanes and innumerous Ghats, with devotees performing their traditional rituals in the Ganges and the people flocking to this city to attain salvation.Apart from the mornings on the Ghats and rituals at the temples, Varanasi is famous for producing the most beautiful and ethnic silk saris those are world famous. The beetle leaf, the Benarasi paan from the city is equally famous for its pungent taste yet soft structure.Varanasi is a haunting city of dignified buildings, although many of them crumbling, glorified by myth and legend. An old eternal city sanctified by religion retaining its very special vitality.A visit to Varanasi is experience of some kind. For some its self discovery, for others its salvation while for some it's just an ancient city and few unlucky ones who carry back nothing but only worst of the memories from the city. Location: Varanasi is strategically located on the Delhi - Kolkata route on the banks of the great River Ganges. Placed around 300 kms from the capital city of Uttar Pradesh, Lucknow, Varanasi is one of the most ancient inhabited civilizations on the earth. 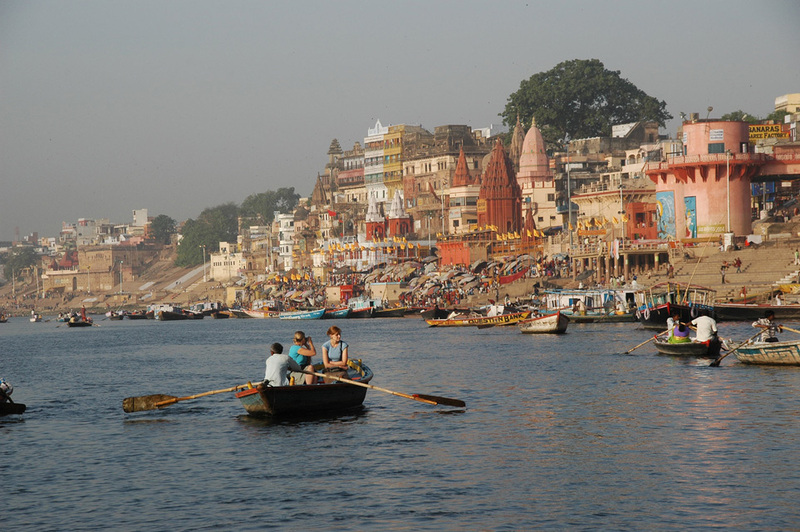 It is based on the banks of tributaries of the Ganges, the Varuna and Asi rivers and hence gets the name of Varanasi. All the Ghats are placed in the periphery of four to five km stretch on the bank of the River Ganges. These Ghats are best visited at dawn, before Sunrise. A boat ride on the River watching the sun rising and at the same time following the traditional rituals of the devotees is a picturesque sight. Sunset is another time to visit the Ghats when hymns are sung in the praise of The Almighty and the Ganges worshipping with lamps. By the time the sun dips down, men and women place small lamps on leaves and sail them in the river as an offering. Hundreds and thousands of lamps sail in the calm waters giving an impression of star lit sky. A beautiful mesmerizing site not to be missed. 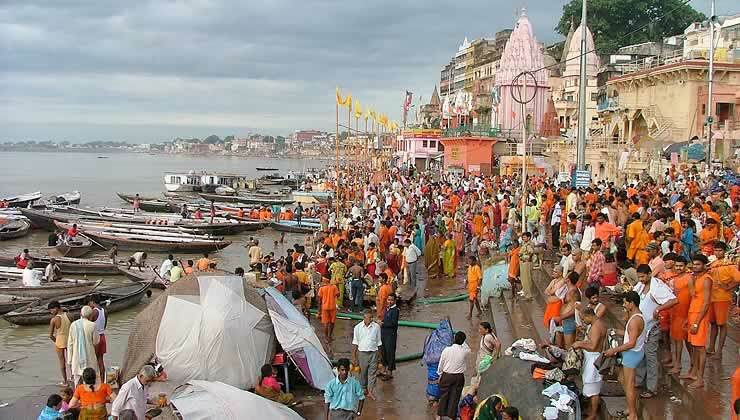 The Dasashwamedh Ghat quite unspoilt and beautiful Ghat is the most famous Ghat of Varanasi. It offers a splendid view of the water front and has a mythological legend behind it. It is said that the Ghat is where Lord Brahma sacrificed 10 horses to bring back Lord Shiva after his banishment from the place. So it is considered to be the most pious of all the Ghats in Varanasi. The Manikarnika Ghat was once a pit dug by Lord Vishnu by his charka and filled it with his perspiration while performing various penances. While Lord Shiva watched him, his ear ring made of pearl fell in to the pit giving it the name of Manikarnika. Another Ghat is known as the Chakrapushkarni Ghat where Lord Vishnu lay is footprint. Other famous Ghats are the Manmandir Ghat, the Hanuman Ghat and the Kedar Ghat. The presiding deity of Varanasi is Lord Shiva and the temple is dedicated to the same. Also known as the golden temple owing to the golden top donated by the Maharaja of Lahore, Punjab in 1885 A.D. the structure of the temple is new. It was rebuilt in 1776 A.D. by Ahilyabai Holkar, the Maharani of Indore. Although the structure is around 250 year old, the idol, the Shiva Lingam is believed to be ancient. It is said that the idol was well preserved by the priest of the temple during the demolition of the temple by The Mughal king Aurangzeb in the 17th century. The temple is a major attraction of the devotees to Varanasi other than the Ghats. A unique temple and probably one of its kind in the whole of India, this temple is dedicated to the country, the mother land. The temple built by Babu Shiv Prasad Gupta and Durga Prasad Khatri was inaugurated by Mahatma Gandhi in 1935 A.D. It houses a beautiful map of India carved out of marble. Dedicated to Goddess Durga, denoting the energy, this is one of the important temples of the city and is built in the Nagara style of Architecture in the 18th century. This Islamic place of worship is placed just next to the Kashi Vishwanath temple. It is said that the earlier structure of the Kashi Vishwanath stood right where the mosque stands today. The temple was demolished by the Mughal King Aurangzeb in the 17th century and built a mosque here naming it the Alamgir mosque. The Vishwanath temple was rebuilt later. The mosque is also known as the Gyanvapi mosque. The most important pilgrimage centre for the Buddhists, Saranath is hardly 10 km from Varanasi. It is here that Lord Buddha preached his first sermon unfolding the four noble truths of life giving the eight fold path to Nirvana or enlightenment in 530 B.C. It was at Saranath that Lord Buddha preached the middle path which became the corner stone of the Buddhist religion. Saranath was called as Sarangnath earlier another name of Buddha in his previous births as the king of Antelopes. Sarangnath later came to be known as Saranath. Another reason is may be that the place where Buddha gave his first sermon was in a deer Park and hence the name of the lord of the deer, Sarangnath. Saranath was made into one of the major Buddhist religious destinations after the great Mauryan emperor Ashok realized its historic importance. He built the magnificent Stupas and buildings patronizing the place. But today what we see of this place is just the ruins of which was described as the Turning of Wheel of Law, by the Chinese traveler Xian Zhuang in the 7th century. 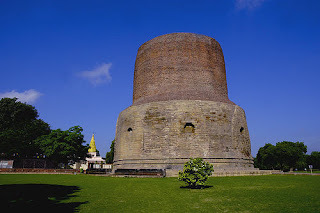 The Dhamekh Stupa built in the 6th century is the only proper monument that stands today. It commemorates the spot where Buddha gave his first sermon to five disciples. Hardly anything of the magnificent Ashok pillar remains. But the inscription on it tells the monks to lead the path of religion without breaking the Sangha. The Archaeological Museum of Saranath however is probably one of the best and outstanding archaeological museums in the country. It displays the artifacts that were excavated from the ruins of Saranath. The most notable being the Lion Capital which once surmounted the Huge Ashok pillar with four back to back lions. The Lion Capital, carved from one single block of rock, has been adopted as the national emblem by free India. The four back to back Lions have a four panel band which features Lion, Elephant, Horse and Bull. The Capital stands on an inverted Lotus flower which is symbolic to the seven lotus flowers which bloomed after Buddha's death. The Museums contains many other relics built during the Mauryan period dating back to the 3rd century B.C. The other important place in Saranath is the temple built by the Mahabodhi society in 1931 which has the original relics of Lord Buddha in a silver casket. The interior of the temple are decorated with beautiful frescoes depicting the life of Buddha and also has a replica of 5th century statue of Buddha in Gold.